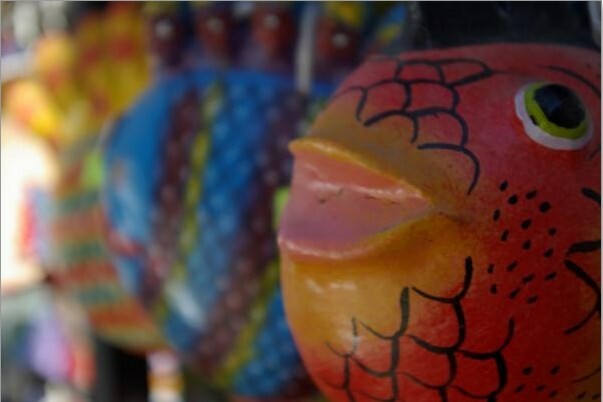 Fine and distinctive folk art has a long and superb tradition in Sayulita Mexico. The Olmec culture was crafting distinctive pottery some 3,000 years ago along with stone carvings, including those enigmatic and mammoth carved heads. Every major civilization - Maya, Aztec, Zapotec, has produced outstanding artifacts made from clay, both functional and decorative. These enduring craft traditions have come down to the folk artists of today. In the several fine artesanias shops in Sayulita, you will find a wide range of excellent arts and crafts. 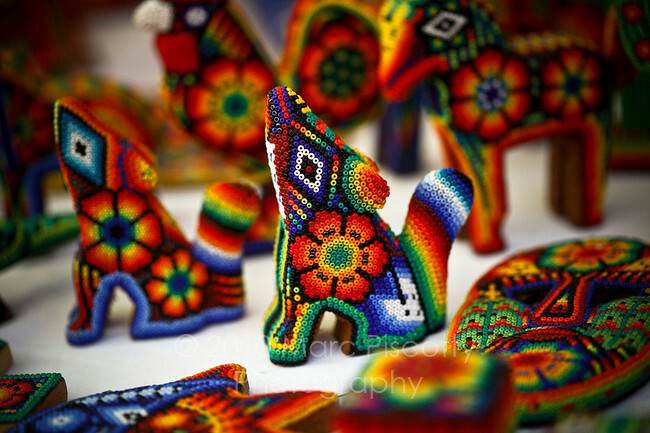 The first you might want to learn more about and appreciate is the work of the Huichol artists, who live in the northern mountains of our very state, Nayarit. The yarn art produced is superbly done and highly collectible. At first, the colorful and vibrant images may seem exotic, but you soon will find that the combination of technique, design and religious symbolism is of very high order. My wife and I have purchased several pieces from Huichol artists, who set up every day in front of Chocobanana restaurant, on the plaza. The Huichols also make finely detailed items from colorful beads. Be on the lookout for the ceramic output of the Ortega family. All over town, you will see the fabulous, colorful crowing roosters in all sizes, the towers of different animals, along with pigs recklessly driving cars and loco red roosters on surfboards. All of the Ortega original pieces are signed and are always fun to look at in the stores or, even better, in your home. Just looking at them makes you smile. Very evident, too, are the fine, green, high-glazed ceramics, often done in "pineapple" variations. The best pineapple ceramics (lamps, decorative items) are crafted by Pedro Hernandez in Patamban, Michoacan, a very important folk art center. Metal work stands out, from large, shiny copper pots to fine work in jewelry. Also notable is the colorful, low-fired pottery produced in villages around Ocumichu, featuring playful and fanciful devils tormenting people - scary and humorous at the same time. The creativity of these Ocumicho ceramics knows no limits. Wooden masks are made in many areas of Mexico and the best are very highly collectible. In Zacatecas, outside of Guadalajara, there is a stunning museum with over 6,000 masks from every district and from every era. The best of these reach the highest level of creative art. Some of my favorite folk art pieces found in Sayulita are the carved wooden animals from Arrazola, in the state of Oaxaca. Many years ago, the great artist, Manuel Jimenez, began carving stunningly beautiful animals. His sons and grandsons have carried on the great tradition and now hundreds of excellent artists are working in different villages around Oaxaca. Signed pieces are the mark of those most desirable to collect. Intricately carved black ceramics also come from Oaxaca, as well as fine rugs. Another of my favorites are the ornately carved wooden spoons in spoon racks. The carving is exact and superb; each one is different in size, some containing over 40 spoons and stirrers. The master of this genre is Jose Baez. This, of course, is just the tiniest tip of the folk art iceberg. Good examples can be found all over town as well as in the street markets. Galeria La Hamaca, right off the plaza, sells top-of-the-line items. 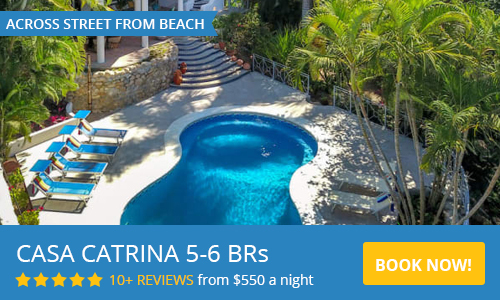 Arte de Sayulita has a wide range of pieces, and certainly Gypsy Galeria. Galeria Agua Tierra and Galeria Tanana have wonderful examples of Huichol artwork. And, while they may be artistic treasures, Mexican folk art, even the best, won't break your personal treasury. 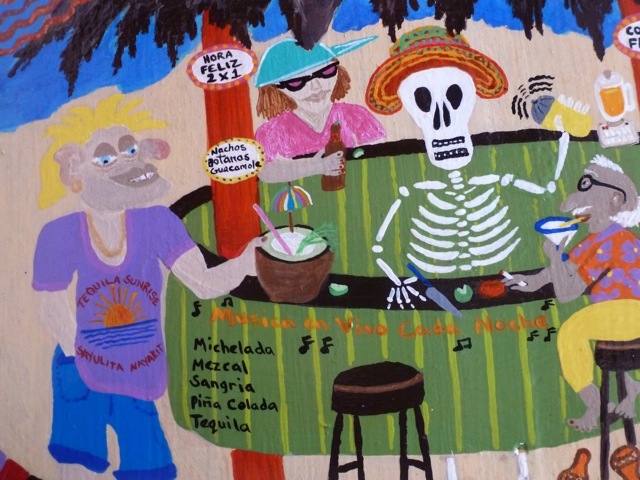 Celebrate the wonderful artistic expressions that boldly sing "Mexico and Sayulita."